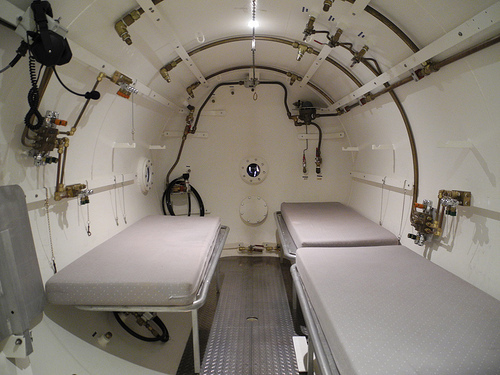 Health Costs > How Much Does the Hyperbaric Oxygen Therapy Cost? How Much Does the Hyperbaric Oxygen Therapy Cost? Hyperbaric oxygen therapy, also known as HBOT, is a therapy that involves breathing in pure oxygen while inside a sealed and pressurized chamber. This allows your lungs to gather more oxygen, essentially increasing the level of oxygen that the blood can carry to your organs and tissue. The prices of hyperbaric oxygen therapy may be covered by your health insurance policy, but it will depend on the condition you’re being treated for. Although this therapy is considered to be an established treatment for conditions such as treating an infection or wound, there’s insufficient evidence to support claims for allergies, autism and cancer, for example. Those who have health insurance may only pay $10 to $65 per session, whereas someone who isn’t able to have insurance cover it may pay between $125 at a local clinic to close to $1,000 at a local hospital. Depending on the condition you’re being treated for, you could need upwards of 20 to 50 sessions to see desirable results. Ogenix says the average session can cost $350, and the average patient needs 28 sessions to see results, bringing the total to $9,800 without insurance. The Center for Autism Research and Education says an individual 50-minute session will cost $100, or if a series of 40 is scheduled within a three-month timeframe, then the costs would drop to $3,000. A discounted rate of $2,500 is offered to those who prepay for 40 sessions within three months. During a session, you will be asked to recline in a chair while sitting inside the pressured oxygen chamber. This procedure is relatively painless, but some patients, who have undergone the procedure, stated they have felt dizzy or ear pain after the session was done. There are two popular types of chambers: a monoplace chamber and multiplace chamber. A monoplace chamber will be designed to treat one person only, whereas a multipleace chamber can hold several many people at a time, and the oxygen will be dispersed via a mask or hood. The use of this therapy is said to increase the oxygen tension levels in the blood and tissues and is often used to treat wounds and infections. With HBOT, the increased levels of oxygen will be dissolved into the body’s fluids, the plasma, central nervous system, the lymph and bones. In this way, the extra oxygen will be able to reach the damaged tissue to help support its own natural healing process. This increased oxygen level, according to HBOT.com, can enhance the ability of white blood cells to kill the white blood cells, essentially reducing the swelling and allowing the newer blood vessels to grow. The average treatment session will last one hour. Again, depending on your condition, additional tests may be required ahead of time. This may include x-rays, blood tests or a simple physical examination. Medicare Part B, for example, will cover HBO therapy as long as you have a certain condition. Refer to the link to see who’s eligible. The following conditions are often covered by insurance, but again, your insurance policy may vary, so it’s always best to confirm before assuming. These conditions include gas embolism, carbon monoxide poisoning, decompression sickness, diabetic wounds, gas gangrene, intracranial abscess, necrotizing soft tissue infections, radiation tissue damage, osteomyelitis, skin grafts and thermal burns. The most common side effects can include slight ear or sinus pressure or blurry vision; however, these side effects can be avoided if you clear your ears during the session or have tubes inserted in your ears. If you have insurance and want to have it covered, be sure to check with your insurance company first to make sure the policy will cover it. You will also want to make sure you’re choosing a provider who uses your health insurance carrier. Regardless of your condition, there’s a good chance you will need more than one session. By purchasing sessions in bulk, you may be able to save as much as 40 percent.